A medley of garden vegetables, including green bell peppers, orange carrot coins, green broccoli florets, and white cauliflower florets, are cooked and piled high on the bed of sauced gemelli pasta. Top with shaved Parmesan and basil chiffonade. 1. Heat oil over medium heat. 2. Add onion and salt. 3. Cook briefly, 1-2 minutesCCP: Keep all ingredients, except spices, chilled below 40° in display cooking station. green pepper, diced 1/4-inch	 2 lb. carrot, peeled, 1/4-inch diced	 2 lb. red bell pepper, diced	 2 lb. 4. Add vegetables and heat till soft.CCP: Cook till internal temperature reaches 165°. 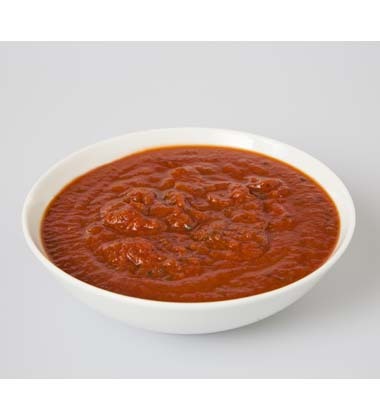 Vine-ripened tomatoes provide the base for the perfect balance of sweet tomato taste and savory Italian seasonings…a true classic! gemelli (twin twist tube) pasta, cooked, chilled	 30 lb. 5. Add sauce and pasta and heat through. 6. Portion into pasta bowls and top with basil and Parmesan.CCP: Heat sauce till temperature reaches 165° or higher for 15 seconds. 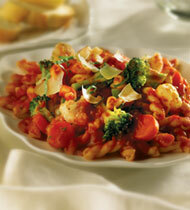 **Could substitute whole wheat pasta, bowtie pasta or orecciette pasta. red bell pepper	 1.5 lb. gemelli (twin twist tube) pasta, cooked	 30 lb. Could substitute frozen mix vegetable blend, such as Italian or Scandinavian, for fresh vegetables in this recipe.